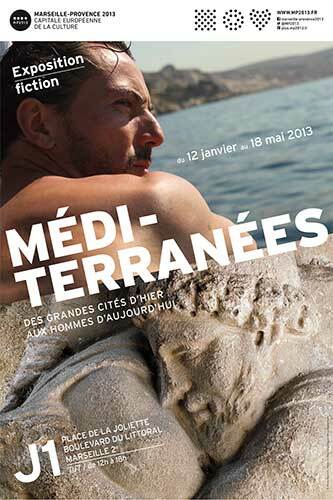 Méditerranées was a major exhibition to mark the beginning of the European Capital of Culture year 2013 that take place at the J1 in Marseille. It begins with a small boat from Marseille filled with seafaring people who tell the story of their Mediterranean – with or without an accent – through an unpredictable voyage. It is the tale of a modern day Ulysses who sets off to meet his contemporaries and discover their world before travelling back through history in an attempt to learn how our Mediterranean universe was built. His ports of call include the ancient city of Tyre where he meets the Phoenicians, to whom we owe our alphabet. Next, he travels to Athens, where Pericles used his strong naval fleet to instil democracy. His voyage then passes through Algiers, Tunis and Tripoli under the Ottomans, and ends in nineteenth-century Marseille, when the city prospered thanks to technological advances and colonial conquests. Visitors to the exhibition will make their way in any order they wish through eleven stages, where boats — triremes, galleys, xebecs, or ocean liners — show the importance of navigation to Mediterranean civilisations. Between the containers used to house the exhibition, visitors will be able to glimpse the sea while discovering Greek and Roman masterpieces: bas-reliefs, oil paintings by the masters, rare manuscripts and ship models. Also on view are Roman mosaics, illuminated medieval manuscripts, and posters from maritime companies. These images will come alive thanks to audio-visual technology and images by contemporary artists. The exhibition Mediterraneans brings together a corpus of 171 pieces of artwork presented as part of 11 historical periods. Each period features a different theme, which is presented through short animated films. These films were produced by a team of seven young directors led by Paul Bourgois. The comic book artist François Schuiten, working in tandem with Bourgois and the 3D animator Colin Toupé, put his talents to use imagining the library of Alexandria and the wise men it welcomed. However, the exhibition’s originality lies in its ability to combine and interrogate past and present. For this purpose, director Malek Bensmaïl has come up with a modern Ulysses who sets off in search of his contemporaries. Never at home, this man is at home everywhere – in tune with those he meets in the ports of these Mediterraneans. People tell him their hopes and fears for a constantly changing Mediterranean region. To conclude the exhibition, photographer Brian Griffin has recreated the transport hub at Fos-sur-Mer as part of a behind-the-scenes look at the globalised twenty-first century – its architecture, its labyrinth of containers, and its people.